Investor Pulse from Spectrem Group is a monthly reading of investor attitudes. The report is fielded each month to a group of approximately 1,200 investors. 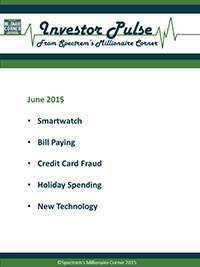 This month’s topics include: Smartwatch, Bill paying, Credit card fraud, Holiday spending and New technology. Fact of the Day: Will Investors Buy the Apple Smartwatch? Who Actually Pays the Bills?